Only two hours away, the city of Richmond is a great place to get away for the day after a long week of classes. For us writers at the Daily Runner, Richmond is one of our favorite destinations. 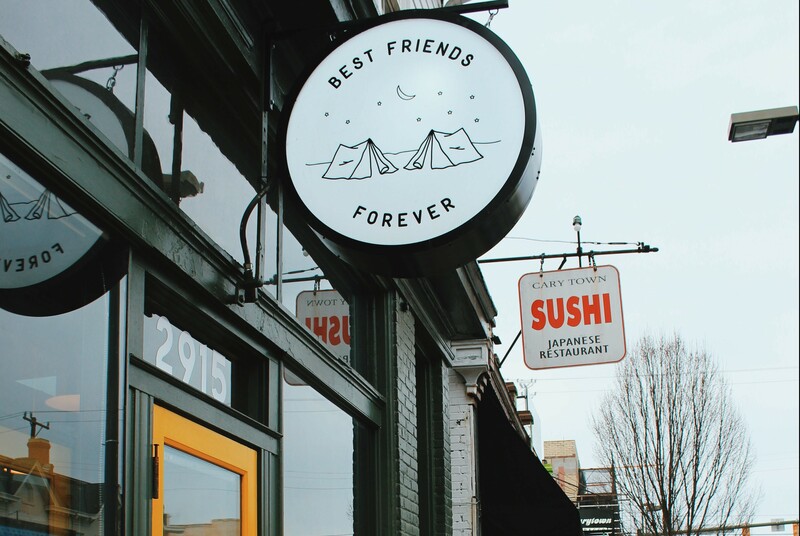 We decided to band together and show you a few of our favorite spots in this historic city. Come along with us and spend six hours in Richmond! Abigail Moreno-Riano: Richmond’s creative atmosphere ensures plenty one-of-a-kind coffee experiences. We choose Sugar & Twine, a refreshing coffeehouse in the midst of Carytown that uses Blanchards, Roastology, and Trager Brothers Coffee. The first thing that hits you upon entering is a genuinely hospitable atmosphere. With the warm lighting, wooden shelves, and white couches, this place is perfect for the studious or social type. The pastry counter itself is almost a work of art, housing anything from brownie sandwiches to cheddar biscuits to hand pies. It can be a little overwhelming when choosing which treat you’d rather splurge on, but go with friends and split a few treats so you won’t feel obligated to buy the whole menu. Once up to the counter, it’s hard to choose between a $2.75 cortado (so cheap!) or just a simple Americano. That being said, their espresso was great and well-worth the low prices! Emily Mowry: Just down the street a bit from Galaxy Diner, you’ll run into one of our favorite stores: Plan 9. It is a simple yet lively record store. Records, CDs, and tapes run all around the room, and the walls are decorated with posters of musicians through the ages. If you look long enough, you will find some amazing music that you wouldn’t see just anywhere. In the back section, there is a record player that you can test the things you find on. Behind that, there are rows of old records that you are bound to find something good in. There has never been a time where we have gone there and not wanted to buy something. So, if you love music, beware. But also. Just go. E. M.: This store is a must-do in Richmond. Right when you walk in, you’re greeted with the warm smell of vanilla candles and cinnamon. Which makes sense because, well, they sell candles. Even more, the walls are lined with cute little things that you definitely don’t need but desperately want. We found some amazing vintage posters and adorable fox salt shakers! There is also a terrifying duck thing that Renée took quite a liking to. You’ll have to go there to understand. E. M.: Let’s begin this section by stating that if you go to Richmond and are also a human being, you MUST go to this store. It is a bookstore like no other. Right when you walk in, you see the things you would expect from a bookstore: bestselling novels, some nonfiction written by celebrities. BUT, when you go upstairs, there’s a whole other world. This section has all kinds of used fiction books. You can find all kinds of fiction, nonfiction, poetry, and philosophy books for a great price. If you can’t find anything there, make sure to check out the “blind date” section by the door. They wrap books and put descriptions on the front. Pick one! Who knows, you might just fall in love. Renée Hogan: After searching around for somewhere new to try, we gave into our hunger and went to the classic: Galaxy Diner. And you should too! This place is known for its delicious comfort food and sci-fy inspired 50’s diner décor. Breakfast is served all day and milkshakes, burgers, sandwiches, and so many sides are on the menu as well. All entrées are served with a fried pickle and two sides, enough food to keep you full for the rest of your day in Richmond! Our recommendations: any (and all!) of the burgers, spiced apples, mac n’ cheese, and french toast. R.H.: If you were raised in the area, you probably went to Maymont at least once. Maymont is an estate park comprised of one hundred acres of rolling hills and exotic gardens. It’s a great place go exploring. If you have a camera, bring it; you’re going to want to take photos! Otherwise you can be like yours truly and climb all the trees and frolic through the fields. According to their website, Maymont was given by James and Sallie Dooley, who lived in the mansion on site from 1893 through 1925. They gave their property to be preserved as a public park for the Richmond city-dwellers to get away and enjoy the outdoors. Make sure you get there early, it closes everyday at 5:00 p.m.
R.H.: Belle Isle is a small island in the James River, which runs right through the center of the Greater Richmond Region. Absolutely stunning in all seasons, this is a place you’ll want to go back to again and again. Large rocks fill the river, making it fun and easy to cross. The island itself has trails and abandoned buildings perfect for a late afternoon walk. The first time our crew went to Belle Isle we caught the sun setting over the west-facing part of the island. It was so serene and gorgeous, we would totally recommend the experience. Word of warning: after the sun sets, it gets dark. You may already be aware of this fact of life. But in case you, like us, briefly forget this fact while swept up in the beauty of the sunset, just make sure you plan your return before sunset as the park closes at dusk. Either way, enjoy the adventure! A. M.: Just a few blocks from VCU’s campus, Shyndigz was the culmination of our day. Within five minutes we ordered and received our desserts, speaking to the convenience of their to-go style (why don’t more places do this?!). The Salted Caramel Chocolate cake has six layers, filled with creamy chocolate fudge in the middle. Each slice is served with the salted caramel sauce that is so good you will be tempted to buy a jar for later. The Key Lime Pie, which is never my first choice, exceeded expectations. It was creamy and genuinely lime-flavored, without tasting artificial. The crust, which is used on all their pies, was the perfect thickness. The Peanut Butter Pie, however, was the star. The filling was so light but had just the right amount of peanut butter flavor and the crust was just as good. Go with a few friends and enjoy some of the best desserts you’ll ever eat. R.H.: It was a Sunday, so we went to the Shyndigz Market & 2go Cafe, which is grab-and-go style, but right across the street they have a full sit-down location complete with Pinterest-worthy twinkle light and mason jar décor! Before you go, check out their website for hours and the full menu. What are you waiting for? Grab some friends and spend a Saturday in Richmond. We promise you’ll come back refreshed and ready for another week of classes! Renée Hogan and Emily Mowry are Department Heads for The Daily Runner. Abigail Moreno-Riano is a contributor to The Daily Runner.